Last week we posted on staying protected in an instance of a storm involving lightning, and today we are finishing our two part series by writing about keeping your home and valuables protected in such a case. While most standard home insurance policies cover damage that can result from lightning strikes, such as fires, it’s important to double-check your policy so that you know that your policy is up-to-date and accounts for any kind of renovations or improvements that you may have made to the house. The two most common types of loss from a lightning storm are damage from fires caused by lightning strikes, and power surges. Use surge protectors for expensive equipment. Typically, you get what you pay for, so a more expensive surge protector might offer better protection, such as including a surge arrestor which can help prevent electrical fires. In addition, surge protectors carry different warranties; usually the manufacturer of a surge protector will agree to pay a certain amount of money to have damaged electronics replaced if they were damaged as a result of a power surge when plugged into the surge protector. Unplug electronics that you don’t use on a regular basis. Not only can this lower your electric bill (electronics use electricity when plugged in, even if turned off), but it can prevent electronics from being damaged in the event of a power surge. Unplug electronics during a storm or if you plan on leaving your home for a long period of time. Install lightning rods to divert and ground lightning. Cut down large trees around your house to avoid having your house damaged in the event that a tree is knocked over during a storm. 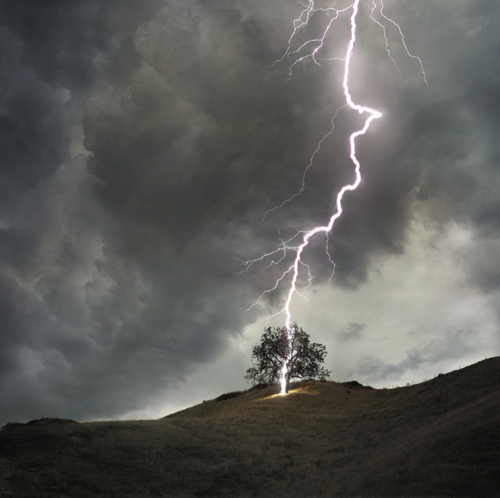 Install a lightning detector, which can give early signs of an incoming lightning storm, and can protect your home by disconnecting power lines and providing temporary power. For more information, you can review our previous post about lightning strikes, or call Murray and MacDonald Insurance Services at 508-540-2400.